Yesterday the first module of Whole Food Kitchen (12 week online whole food eating workshop) was released. I still have to read through it more thoroughly, but I jumped right back to the recipes. 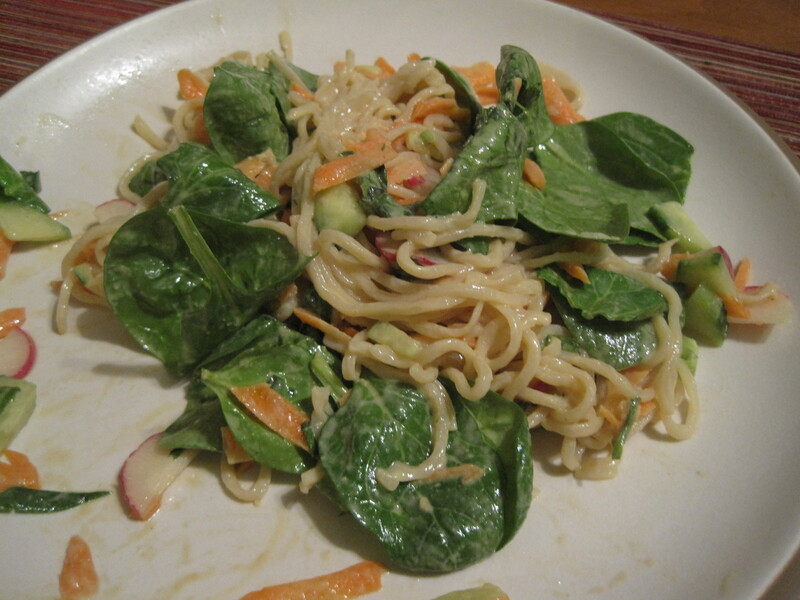 Last night I made Sesame Spinach Noodle Salad. It was awesome! I had a little trouble finding a few ingredients, made a quick sub on the noodles and it turned out just fine. I’m looking forward to digging in to this online workshop. This week there was even a tutorial on how to make your own almond milk! This entry was posted in Uncategorized, Whole Food Eating. Bookmark the permalink. I am very much looking forward to this workshop as well! I can never really follow recipes, mainly I am looking for new ideas :-) I will hopefully be trying to make the almond milk this weekend…we shall see how that goes! I don’t have one of those awesome vitamix blenders…hoping mine doesn’t die! I just have a regular blender. I’ve never used it for almond milk, but it works fine for smoothies, so hopefully it will work! I’m so nervous about trying the almond milk. I’m hoping to try some of the recipes over the weekend. The week has been a little crazy with long work hours and not much time to cook. Now that I have some recipes I can be better prepared. Your salad looked delicious! I think I am going to have to improvise on some of the recipes as well.